After graduating from Trinity College, Cambridge with a degree in Classics, I started my working career as an audit assistant. However, I soon found the world of bean-counting too racy for his taste and retreated to the calmer pastures of the insurance industry. I had a successful business career, during the course of which I co-authored two books on public sector risk management, which were adopted by the Institute of Risk Management as their standard text books. 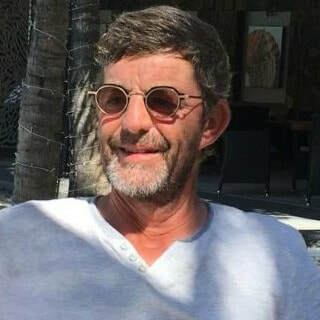 Since retiring, I have had the opportunity to develop his interests, mainly reading, writing and thinking or, as my wife puts it, “locking myself away in my office for a few hours a day”. In particular, I have been blogging and writing in a tongue-in-cheek, irreverent style about the quirks, idiocies and idiosyncrasies of life, both modern and ancient. Since leaving the insurance industry behind I have written and published three books, Fifty Clever Bastards, Fifty Curious Questions and Fifty Scams and Hoaxes, all of which are still available from all good book retailers and high-class charity shops. 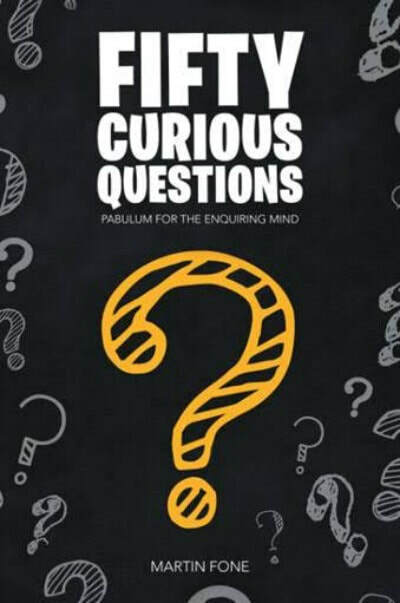 Fifty Curious Questions was a category finalist for the Eric Hoffer Book Awards in 2018 and was serialised by Country Life magazine’s social media platform. Since then I have contributed regularly to their Curious Questions section which appears every Saturday. 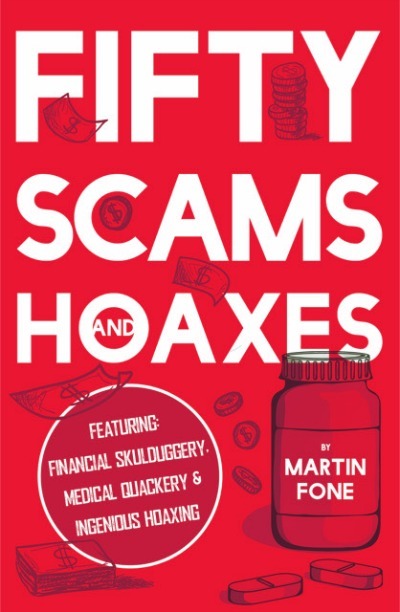 Fifty Scams and Hoaxes generated some favourable media attention and I appeared on the Matthew Wright show on talkRADIO and the David Jemitus show on Brooklands Radio, talking about the book. ​Author Martin Fone explores the psychology and methodology deployed by the scammers and shows what can happen when avarice preys on credulity and gullibility. The key characteristics he unearths amongst his despicable gallery of scammers includes; incredible claims, creative use of advertising, playing on people’s fears and aspirations, unscrupulous business practices and, when it all goes wrong as it often does, a propensity to flee the scene and leave others to pick up the pieces. As featured on the Matthew Wright show on talkRADIO and Surrey Life. ​In Fifty Curious Questions we will explore how our body works: why we blush, why we feel colder when we step out of the shower, and whether there is a finite limit to how long our hair will grow. We will perfect some essential life skills such as how to spot a liar, handle a hangover, rid ourselves of hiccups, and construct the perfect cream scone. There are some deep existential questions to answer, like how long is a generation and whether we are only six feet away from a rat. And then there are some really maddening questions like, Why do we still use a QWERTY keyboard? and Why do the British persist in driving on the left hand side of the road? All will be revealed inside these pages. We also consider some left-field questions like: Do we lose weight when we fart? Do elephants take longer to urinate than horses? and When you are caught in the rain, do you get wetter if you run or walk to your destination? Life would be all the poorer without the answers to questions like these. Serialised by Country Life Online in 2018. A category finalist in the Eric Hoffer Book Award, 2018. ​The road to becoming a successful inventor is not an easy one. Paved with difficulties, roadblocks and sometimes sheer, back-to-the-drawing-board failure, the challenging journey has meant that plenty of geniuses have been lost to history and never given the credit they deserved for creating some of the most invaluable items of our time. However, over the course of Fifty Clever Bastards these same forgotten inventors and their unbelievable stories are about to be inducted into our illustrious Hall of Fame. Designed to celebrate all those who fell by the wayside, Fifty Clever Bastards comes to understand just what happened to so many of people behind the things we take for granted. Covering their incredible tales, the book details the unlucky inventors that were killed by their own inventions, debased by fraud or those who mysteriously took their ideas to the grave. 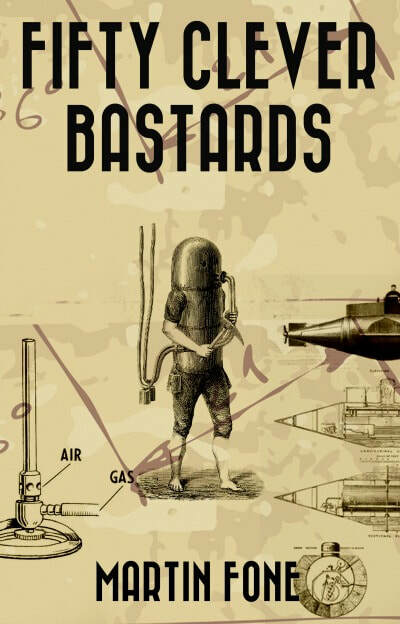 Including aviators from the first millennium CE, pioneers of medicine and science and individuals who took their zeal to learn just a bit too far, Fifty Clever Bastards promises to shine a light on all of the crazy, wonderful inventors that history forgot. Responsible for some of the biggest breakthroughs the world has ever seen (and for appliances we use every single day), thanks to Martin Fone’s book, Fifty Clever Bastards, some of the greatest geniuses of our time have finally been given their due.